With upcycled furniture, a great wood burning stove to snuggle up to and delicious homemade food. 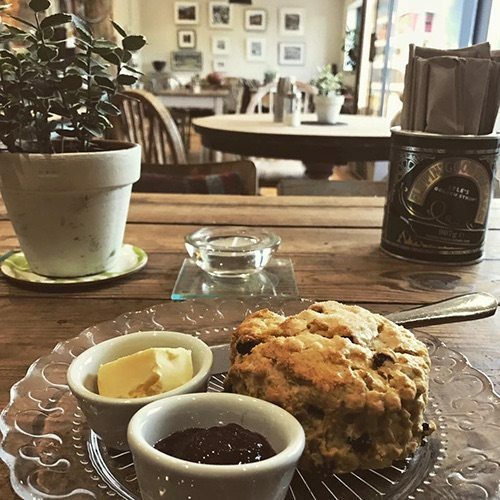 The coffee is lovely – I adore their soya lattes and their unusual flavoured scones. Get your rustic bread’s here too..
We hope our passion for our truly special tea-room is infectious. We give all our visitors a warm welcome and strive to make them feel part of our community. We are delighted that so many return with family and friends and feel truly ‘at home’ in the Rusty Bike. "Lovely warm welcome. The soup of the day was fantastic, really recommend you have some. I love the cakes and I had the carrot cake. Yummy. Will go back again and have recommended the cafe to loads of friends.."
"Great cosy place for a catch up with friends. Nicely decorated interior and good atmosphere, great selection of cakes. " "Visited for morning coffee/hot chocolate and cake; all very good and drinks nice and hot. Café was busy, mainly with cyclists, but plenty of tables and service quick, friendly and efficient.."
"A great place for coffee and snacks. We visited after walking from Osmotherly. Dog and veggie friendly. Will definitely be back.."